Help keep your kids’ digestive tracts healthy and their immune systems strong with VivaNutrition probiotic 5 Billion CFU of BB-12® Bifidobaterium bacterium which has great benefits for gastrointestinal health and immune function. Assisting in the development of a healthy microbiota, preventing diarrhea and reducing the side effects of antibiotic therapy. VivaNutrition® quick dissolving Probiotic packets restore the balance between good bacteria and the otherwise non-beneficial bacteria in your child digestive system. Supports a child’s health by fostering the proper balance of good bacteria in the gastrointestinal tract. Helps support kids’ immune systems. Works naturally with your child’s body. Vivanutrition® Kids Daily Probiotic Packets are easy to take (especially for little ones). Contains none of the following: gluten, dairy, lactose, milk, added colors, preservatives, yeast or soy5. Billion CFU’s of BB-12® Bifidobaterium bacterium. Take one (1) packet daily to support immune and digestive health. Mix entire contents of one (1) packet into cool food or drink. Do not add to hot food or beverage. To alleviate occasional digestive distress, take two (2) packets per day. If taking two packets, take one in the morning and one in the evening. If conditions persist, consult your physician. vivaNUTRITION® can be taken with or without food at any time of the day. 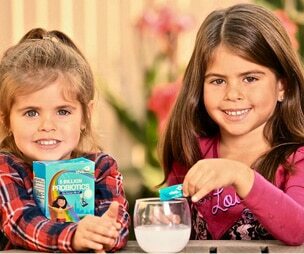 For children over 3 years: Try vivaNUTRITION® Kids Daily 5 Billion CFU Probiotic as directed on the package. “My girls finished their fizzy drink and asked for more, and it’s helped whenever they have digestive problems” – Jenica P.